To provide better care for less, healthcare must join the community – not take it over. In recent years, social determinants of health have become central to conversations about healthcare delivery, and with good reason: medically complex patients and those with unmet behavioral and social needs consume a disproportionate amount of time and money in the healthcare system. Underlying modern medical care is a solid foundation of deep, evidence-based knowledge. Practitioners undergo rigorous training to learn it, and practice specialized methods within highly sophisticated systems to deliver safe and effective care. Equally, social service practitioners undertake their own unique and specialized training. And both social service and medical disciplines need dedication and passion that does not necessarily cross over. We would not expect a case worker to perform a cesarean section, and we should not expect an obstetrician to find a child support lawyer for her patient. Additionally, medical system management of social determinants of health will increase, not decrease, costs. “Super-utilizers” – those 3 percent of individuals who account for 30 percent of healthcare costs –experience social determinants that negatively impact their health prior to entering the healthcare system. Addressing social issues at the end of the cycle is like providing primary care in the emergency room – it costs more and is less effective than preventive treatment. Further, a cross-sectional, longitudinal analysis of 4,774 publicly insured or uninsured super-utilizers in the Denver area showed that fewer than half remained super-utilizers at 7 months and only 28 percent remained at the end of a year , despite the number of people in the cohort staying the same. Some lost coverage and were no longer tracked. Others had improvement in an acute medical problem, lowering their cost to a level outside the high utilizer definition. At the same time, new cases from the community took their place in the high utilizer cohort. At any given time, therefore, those currently being served by the medical system represent only a fraction of the total number of individuals experiencing social issues that will likely lead to super-utilization in the future. Social determinants of health are continually generating new super-utilizers, and the healthcare system does not have the capability or capacity to adapt quickly enough to make meaningful change. Value-based referral to social service provider panel. Easily integrate into value-based healthcare risk models accessible by referral from medical practitioners. 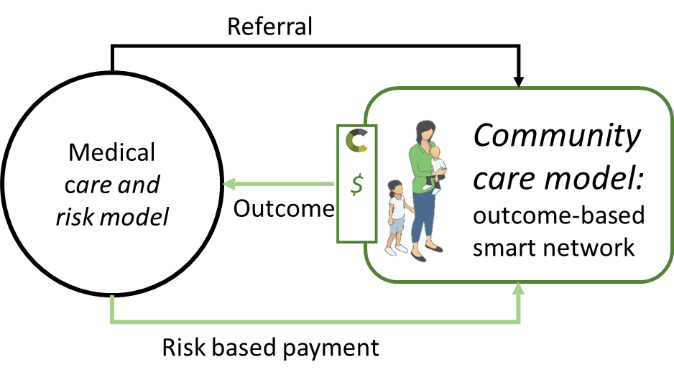 There is an incredible opportunity for medical management, community social service and governmental systems to collaboratively develop a new care model that addresses social determinants of health, better serves the common good and reduces costs. To learn more about Curandi’s vision for improving community health, please contact me at michael.rohwer@curandi.org.